Nayna George sneaks into the Loyola Hall and finds that the META 2017 flag has been hoisted. The fifth installation of Meta- the Josephite Festival of Literature was inaugurated on the 10th of February. The festival was inaugurated by Dr. Cheriyan Alexander, head of the English department, Dr. Etienne Rassendren and Dr. Mini Mark Bonjour. Meta will be held from the 10th to the 22nd of February, with the theme Over the Top. In his inaugural speech, Dr. Cheriyan Alexander welcomed the audience to an all new Meta. With the success of Meta over the years, he remarked that he was “glad to see Meta growing in strength year to year”, especially so since it celebrates creativity. He also said, when speaking about what is so special about the festival: “From the middle of things, we attempt some kind of transcendence, into realms beyond our everyday. 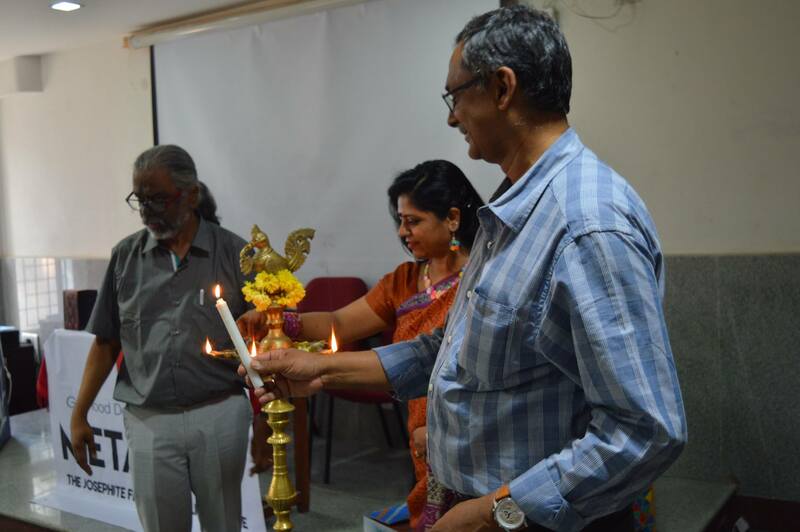 After his address; the dignitaries, Prof Vijeta from the English department, and Drishti from the Joseph’s literary society, lit the lamp. After this, Dr. Etienne addressed the audience. He compared Meta, a ‘little fest’ to ‘little magazine’ that he was part of in his youth. The little magazine offered competition to the bigger commercial magazines.